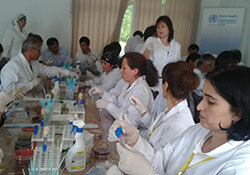 Five days of hands-on laboratory training in Dushanbe, Tajikistan, came to an end on 24 May 2013. Thirty food safety professionals from the public health and veterinary sectors took part in the training, which focused on early detection of Salmonella spp. and Campylobacter spp., two very common bacteria causing foodborne diseases, as well as resistance to antibiotics in these bacteria. Participants deepened their understanding of laboratory methods for detecting pathogens and their resistance to antibiotics. Emphasis was put on the importance of sharing laboratory and epidemiological data between the veterinary and medical sectors to enhance detection, surveillance and control of foodborne diseases. Antibiotic resistance is a significant food safety problem as antibiotics are used and misused in animal husbandry, not only for treatment, but also to promote growth or prevent disease. This has consequences for public health as resistance can be passed from animals to humans through the food chain. The event, organized by the WHO/Europe’s Food Safety programme and the WHO Country Office in Tajikistan, was funded by the European Commission project “Technical Assistance in Support of Health Care Reform in Tajikistan”, implemented by WHO, and WHO’s Global Foodborne Infections Network (GFN) programme. The trainers came from Institute Pasteur in St. Petersburg, Russian Federation and the WHO Country Office in Tajikistan.